Are Your Cancellation Fees Unreasonable? My friend was one of the first people lining up at the store to purchase the recently launched iPad by Apple. He called me just as he was handing over the credit card. Green with envy I rushed over to his place so I could see first hand what the fuss was about. I can categorically state – I’m in love! The audio, video and image clarity is incredible. It’s sleek and lightweight and fun. We spent the afternoon downloading applications for magazines and books – sorry Kindle looks like you will have some serious competition. We watched video streamed through Netflix within seconds of the download. Crossed between a iPhone touch and a laptop the iPad does have some limitations and some hurdles to address so it is probably better to wait until the next version – international sales have already been pushed back to May. However, I’m not going to give you a complete review I found a great one here if you want to read it. What I wanted to let you know is how the iPad can be used from a travel perspective. There are nine really good download applications that avid travelers can access to enhance the user experience. 2. Loopt Pulse – Visiting a strange city and don’t know where you are or what to do or need something to eat? Loopt gives you real time access to maps and photo views. This application is only available in the US at this time. 3. Kayak – similar to their website and iphone app so travelers can search for flights and hotels. 4. FlightTrack – A great way to track flights, get updates on delays or gate changes. The great thing about this application is that if you’ve already purchased it for your iPhone you can use it on your iPad, or vice versa. 5. National Geographic World Atlas – a great planning tool if you’re searching for your next destination but probably not much use once you’re on the road, although extremely helpful to those who are geographically challenged. 6. WeatherBug Elite – the same app is already available on iPhone and iPod and since the iPad doesn’t have a built-in weather app this is perfect. The best thing is that WeatherBug provide global information so it doesn’t matter where you are. 7. Street Maps – one down side to the iPad is that if you don’t have a network signal you can’t use the built in maps application. The Street Maps app, which is available through itunes can be used offline so they’re a good safety net if you’re lost in Paris. NB. You need to download separate street maps for each city you need. 8. Skype or TruPhone – the iPad isn’t the best phone in the world but that’s okay since you can use either Skype or TruPhone. My friend uses Skype so we tested that version. The connection and clarity of sound was awesome. Downside, you do need to be connected to a network so it’s not particularly helpful if you’re in the middle of the Sahara. 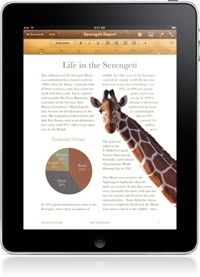 9.	iBooks – I’m an avid reader so having the ability to take my library with me when I travel is a major bonus. No more extra pounds and trying to jam my 800 page books into the hand luggage, or having to leave them behind because I can’t fit them in. This article was originally posted on the MarketingTourGuide.Com Blog.